Customers reach out for help when they can’t solve their problem or find answers to their question(s) on their own. But helping a customer can sometimes be difficult if the agent can’t see what the customer is looking at. With co-browsing software, agents can see what the visitor sees, and provide guided assistance by highlighting items or filling out forms on a visitor’s behalf. Sensitive fields like social security numbers and passwords can be blocked from the agent’s view so private information remains just that, private. Bold360’s co-browse allows agents to follow visitors behind secure fields (i.e. signing into their account) so they can provide support to customers where they need it most. 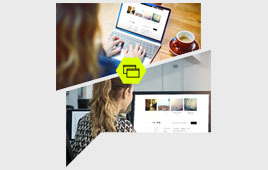 Bold360’s co-browsing solution is designed to provide a simple, more direct way to deliver effective customer support – leading to faster resolutions and improved customer satisfaction. Download the Co-browse datasheet for more details.